Melissa Campbell, Library Director, knows all too well what it is like to be a victim of theft. So she came up with an idea to stop doorstep thieves in Plainville. 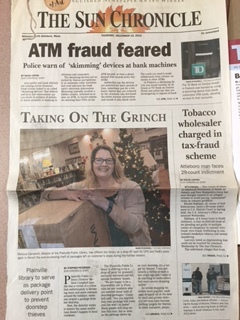 Being that the Plainville Public Library is a trustworthy place in town, the Library Trustees and the Director are offering a Package Pick Up Service. Residents with a library card in good standing can have their packages shipped to “their name” at the Plainville Public Library, where we personally sign for each package. Using the tracking software available through their online retailer, customers will know when their package arrives safe and sound and protected from thieves. 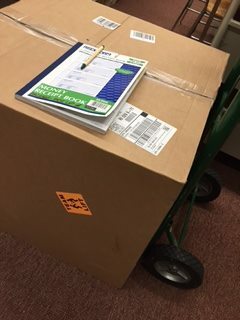 Packages can be picked up by the addressee during regular library hours with their library card and signature. 1. Customers must be Plainville Residents with a Plainville Public Library card in good standing to utilize this service. The Library will accept/sign for packages on the customer’s behalf and hold packages at the library. 3. The customer can use the tracking notification system for UPS and FEDEX for notification of delivery. The library will only accept packages with tracking numbers, no first class mail or envelopes without tracking numbers. 4. The Library will hold the package for pick up by the customer. The library cannot inform the customer of a package’s arrival. 5. Customers can pick up their packages during regular library hours by showing their Plainville Public Library card in good standing and identification which matches the name on the package, and signing the receipt book maintained by library staff, for identification purposes. 6. Packages left at the library longer than 4 weeks after delivery will be considered a donation to the library and handled as per our Materials Donation Policy. 7. Customers assume the entire risk related to this service. The Plainville Public Library is providing this service “as is” and the Plainville Public Library disclaims any and all liabilities or warranties, whether expressed or implied. The customer agrees to indemnify and hold harmless the Plainville Public Library, its officers, employees and agents from and against all suits, claims, actions and expenses arising out of the use of this service.